Cisco doubles down on small cell business with $310m Ubiquisys acquisition. The world of cellular communications has long been populated by large-cell installations. In recent years there has been a movement toward small cells and femtocells that work indoors and out. Cisco is now buying into the small cell movement in a big way. Cisco announced today its intention to acquire privately held femtocell vendor Ubiquisys for $310 million in cash. The deal is expected to close in the third quarter of Cisco's fiscal 2013. Once the deal closes, Ubiquisys employees will become part of the Cisco Service Provider Mobility Group, reporting to Partho Mishra, Vice President and General Manager, Service Provider Small Cell Technology Group. The need for indoor small cells is the key value proposition that Ubiquisys is going after. With indoor small cells, users receive a stronger mobile signal, delivering better voice and data performance. The Ubiquisys portfolio includes small cell solutions for indoor public access, enterprise, residential, and outdoor rural deployments. From a feature perspective, Ubiquisys devices include a capability known as ActiveSON (Self-Organizing Network). The SON is a mesh-like construct that enables multiple devices to be connected to provide better capacity and coverage. The Ubiquisys portfolio isn't just about the licensed 3G/4G spectrum either. 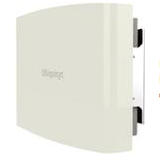 Cisco's new acquisition also has a multi-mode small cell capability with its GM7 device. "In addition to WiFi, the Ubiquisys GM7 runs 4G LTE and 3G HSPA+ simultaneously, with software-defined resource allocation," a Ubiquisys datasheet on the GM7 states. Ubiquisys also will be able to help Cisco's cloud deployment strategy with the Ubiquisys Smart Cell with EdgeCloud technology. EdgeCloud combines a Ubiquisys Smart Cell with an integrated Intel server that can be enabled to deliver applications at the edge of a network. "Cisco is doubling down on its small cell business to accelerate strong momentum and growth in the mobility market," said Kelly Ahuja, Senior Vice President and General Manager, Cisco Mobility Business Group, in a statement. "By acquiring Ubiquisys, we are expanding on our current mobility leadership and our end-to-end product portfolio, which includes integrated, licensed and unlicensed small cell solutions that are tightly coupled with SON, backhaul, and the mobile packet core."